We are looking for you! Yes! We need the bravest warrior. Cause in this game you will fight till the death. Choose the room you wanna to join and win this war at any rate! So, take you weapon and shoot! All the time. You must stay alive. 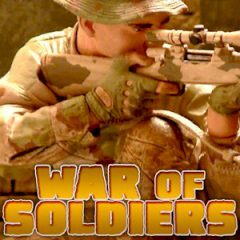 Take part in the real war conflict between conflicted parties, and compare own fighting skills with other players globally. Sink into the amazing world, where you have to defend yourself. Here you will find six maps, seven weapons, and two modes to playing. Watch out! Your enemies are already here! Do not let your chance to slip and show how cool you are. Use arrow keys to move and mouse click to shoot. As in real war, you must be very brave and do not give it up! That is why, if you know how to protect yourself, then do it right now.